So Wednesday is my day off during the week and I tend to fill it with 'bloggy' activities! 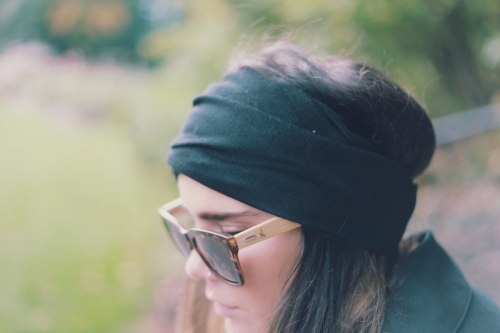 So one Wednesday a couple of weeks ago I met Rebekah, the designer behind Lines & Current. If you didn't see my last post where I styled the ELSKA necklace from L&C or you don't yet know of Lines & Current - you need to get acquainted! "I do have a time where I pressed the button go but it was a long two years of experiment before that. I guess being a mum and then the girls going to school, it opened up a bit more time for me and I knew it would be lovely, perhaps a luxury, to use that time to do something I'm passionate about but that also brings in a little bit of money. I was on a part time basis while the girls were in nursery and P1, as the amount of time they were away wasn't even that long. But even now it doesn't even seem a lot, they are out at 2/2:30 today, so I'm doing pretty much what could be a full time job, in half the time. But back to where it all started, I had been doing some work in the e-commerce world with my husband, and learning without really noticing, how to sell online, picking up on trends etc. I was getting a sense of the online, e-commerce world. Then I went on a trip to China with my husband and other entrepreneurs, and it came at a time of my life where I had just been through some hard stuff, and this trip was a great change, to be around positive enthusiastic people who wanted to learn and it sparked something intangible inside. That was in the Autumn, and if you look at the time scale, in January was when I launched Lines & Current. So I guess that trip did have something to do with it and birthed something in me. So the first week in January 2015 is when I launched the HETTA Hat through a selling button on Facebook - they all sold out really fast and thats when I knew I was on to something, and since then I've been building the brand also rather than just selling stuff... which is just so fun! And I'm really am having a good time!" It's cool how you started with one very successful product, and how the brand has now taken off! "Yea, it's cool and it's just baby steps and not being too constrained by your vision that you're not flexible. " And what about the design process - what does that look like for you? "Well I have lots of ideas, ideas aren't really a problem, and again I don't consider my designs as extremely unique or I'm not like trend setting or anything. I mean maybe someone may think, in a lovely way, that I am? But I don't think of it like that. And for this one (the DELTA), i've been wearing this one for a month now, and theres a 6cm extension on that, and I realised I might even want to wear it lower than that, so then the ones I got made for the launch of the DELTA, I had made amends to the design for. " So you always try it out yourself? "Oh I have to, I never launch something until I know what the problem is with it first, and then if it needs changed - and I mean it's just my ideas of what could be better - but i'm not going to put it out there until I know that I'm really happy with it. So it's just a bit of trial and error with the design. " Do you think that your design process is a unique one, I mean do you know if a lot of other designers would do this too? "I have no idea, its like I have not went to design school or whatever, I just know that thats something I need to do." To me, that shows the amount of thought/care put into each design - it's not just about what looks good, but that the design has to work. Yea, it's got to be functional! What about inspiration - where do you draw your inspiration from? Em I guess the Instagram community is really great for drawing inspiration from, I guess my life, my family, the girls... from a design point of view I think it really is just images that I come across in my daily life and as well problems that I have with style and then i'll try and fix them - For example, I see the jewellery collection as pieces I've designed for girls who don't wear jewellery. It's solving a problem there! Especially as we are moving into this movement of minimalism, the pieces I design reflect this. The designs also solve everyday issues, for example, the chokers that I sell can be worn with high neck t-shirts that come right up to the neck, I wanted there to be a choker style necklace for this, where you can still see it. You know as a girl the problems that you have and you don't even know it's a problem, you just feel the relief of good design, like you want the pocket inside your bag to fit your phone and your lippy! These are everyday issues that I would draw inspiration from. Yea I saw this choker and loved it - where the detail is off to one side...? "Yea why did I do that? I just liked it! for a choker it works, you couldn't do it with the 18inch necklace. " And how do you find juggling your work with being a mum? "Yea, it's pretty intense, now that they are up a wee bit, they do have a lot of work to do when they come home from school. Four nights a week they will have half an hour to an hours worth of homework, and then there's the extra curricular stuff as well, so it's just sucking up the time, and if you wanna live a healthy lifestyle and cook meals that are healthy - it's pretty hard to get the balance! And if I had more hours to put into Line's & Current, I could be very busy with it, but you can only do so much and it's about carving a business that you can really enjoy, and if you take on so much your just going to get so stressed, and i've already felt that at times. " Silly question! Whats your favourite food? I know it's really silly but I really like the comfort of oats, and like porridge in the morning but then on the other hand I love vegetables so much, like I'm really grateful of vegetables in my life! But what would I say is my all time favourite food? This is really hard, but peanut butter is really good, I might go with peanut butter! I love peanut butter also! Do you bake with peanut butter at all? It's good in porridge, and noodles and with spiralled courgette it's pretty good too! Whats your top tip for mums? I guess i'm of the "happy mum, happy baby" philosophy, to look after yourself, your sanity wellbeing, your health your fitness, is really important. And don't think that thats being selfish at all, it's not, if you can love yourself and accept yourself then you'll be a better mum. It's the hardest thing in the world, don't get me wrong, but pursue that, or at least the idea of that. I think its really important to aim for that as a mum of two girls, to love and accept yourself and let that impact them. Has your faith impacted your journey with Lines & Current? I mean I don't consider there to be a difference between the secular and the sacred, because I am a spiritual person, it just outflows, I mean I don't make a conscious decision to have a faith based business at all, and if that message is being communicated it's just because thats the person I am, not because I'm trying to intentionally make an impact if you know what I mean. So this is really just the key moments of our conversation, we had a lovely time sipping smoothies and eating chocolate covered peanut butter balls at Slims! It really was a great experience to meet the lady behind such a special brand - one that I fully admire. 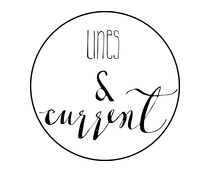 So why have I featured Rebekah and Lines & Current as part of the Inspirationl's series? For those of you who haven't pick up on the "Inspirational's" series yet, it's a series of post's which, up until now, I've only had one entry for (Heres the last one: Linzi Rooney, CEO of Studio Souk). This title "Inspirational's" is what I've given to the times where I meet with inspiring woman, who for whatever reason, I believe have shown inner strength. On a personal level I found myself intrigued to what the story was behind Lines & Current - how it all came about. When I look at L&C's Instagram feed, with the beautiful imagery, along with the website, I appreciated the choice of aesthetic - which was right up my street as one of those girls Rebekah mentioned, who usually doesn't wear jewellery - (unless it's minimal!). But from the point of view of the blog, when I launched "Clothed In Strength" part of my vision for it was to meet with local woman who I personally felt had inspired me and who have displayed strength in one way or another. To me entrepreneurialism is something I have the highest respect for, I grew up in an entrepreneurial environment, from when my dad got married until presently he has been establishing his own business in guitar Luthiery, which is now a renowned brand worldwide. So because of this, naturally meeting with local woman entrepreneurs was on the list for the 'Inspirationals' series. I really do appreciate the strength in taking a risk and believing in your own concept. It's something I hope to do someday. I love the fact that the beginning spark of Rebekah's idea for Lines & Current was birthed out of a trip to China, which was actually after a hard time in her life. I think sometimes our strongest moments are birthed out of our, 'weaker' seasons.